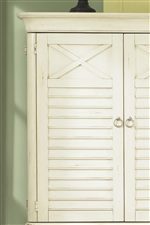 Bring an old country style to your home with Ocean Isle Collection. 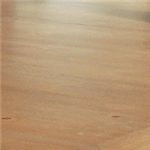 Made of select hardwoods and pine veneers this artificially aged bisque with natural pine finish set will create modest and simple style. 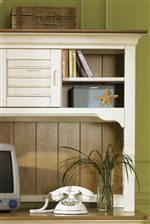 Complete dust proof featured durable items will require minimum care and will serve for years A rubbed White finish on pine, oversized finials, turned legs and shuttered accents complete this breezy look. 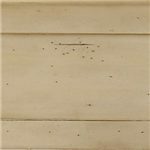 The occasional tables and accent pieces are also available with the same rubbed white finish and distressed appearance. 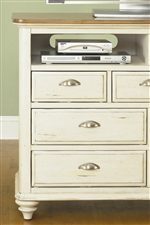 Browse other items in the Ocean Isle collection from Bullard Furniture in the Fayetteville, NC area. Satin Nickel Knob & Cup Hardware. 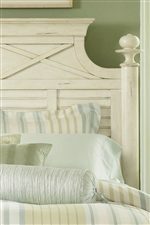 Round Finials, X Motif and White Shutter Cottage Feeling on Headboard. Distressed Finished, Turned Feet & Pine Finished Tops. Storage Shelves & Doors on Student Desk Hutch. X Design & Slats on Armoire.